I've always been a sucker for mob movies, I'm not quite sure why. The best reason I can come up with was that I was exposed to it at a very young age, much like I was with horror, yet horror always trumped everything. There must be something with death that I was intrigued with. In horror you had the over-the-top almost cartoony like deaths while in mob movies you had more ruthless and deaths that were more directly to the point. I guess the realism made it frightening. 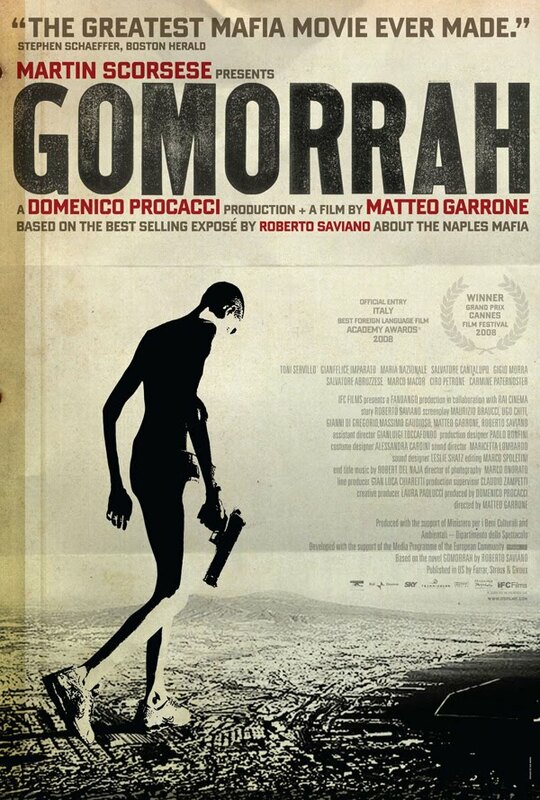 Gomorrah is that ruthless kind of a mob movie. The movie opens up with a scene at a tanning salon. We see a bunch of Italian men having a good time getting their tans. They are naked and in their most vulnerable state; a mistake in the mob world. It's not long before the whole gang gets executed. From the opening scene, you know shits going down. That pretty much sets the tone for the rest of the movie. But Gomorrah gives us more than straight up violence. The movie tells us five intertwining stories from all corners of the mafia network. The movie seeks to give us a glimpse at the lifestyle in such a region. The focus of the stories range from teenagers to young adults to the veterans of the underground scene. I think of all the stories, I enjoyed the one of the two teenagers the best. Inspired by Tony Montana and Scarface, they seek to become a force to reckon with in their region, refusing to listen to or work under any mob; being vigilante's in their own district. From the get go, we know how it's going to end for them, but it's everything in between that draws the intrigue. Just what is their motivation? How did they get where they're at? Why are they firing machine guns in a lake only wearing their underwear? The movie draws a wide range of emotions from its viewers but they are rarely uplifting. At best we feel relieved when certain characters live, while at other times, we're terrified of the brutality exerted on civilians. It can be a tough watch, but the movie is unrelenting in its course. Gomorrah was an Italian produced movie released in 2008. It was based on the book by the same name that detailed the real life crimes of an organized network called Camorra. Though the book was based on true accounts of the mob network, the movie tells fictionalized stories to reflect the true spirit of the crime ridden region. I enjoyed the movie and thought it was quite powerful. Going in, I had no idea that they were based on true events but at the epilogue they tell us some startling facts about Camorra that is quite fascinating. It's worth the rent at the very least. Til next time, later geeks! I thought it was alright. Not bad, but I kinda expected more. Don't know why..